MICROS® is a leading Point-of-Sale (POS) system for a variety of different industries, including hotels and resorts, retail shops, and food and beverage establishments. The POS software giant, which was recently acquired by Oracle Corporation, has been a popular solution with industry customers for years. In addition to MICROS, savvy franchisees have chosen Carillon ERP as their back-office accounting system, payroll and HR. Our ERP system is a perfect compliment to MICROS because we integrate seamlessly with their time entry and daily sales summary functionality. Why is purchasing an ERP software that integrates with MICROS so important for your company? When posting your company’s daily sales, why would you want to manually rekey the information from MICROS into your ERP system, increasing the chance for errors? With Carillon ERP, our system does the work for you, ensuring that your data is accurate and saving your fingers hours of typing. Our MICROS interface also makes your payroll processes a breeze. When paychecks are due and your employees have put their time into MICROS, getting that information into Carillon ERP is simple. Our sophisticated interface will keep you from manually entering your employee’s hours into an accounting system. 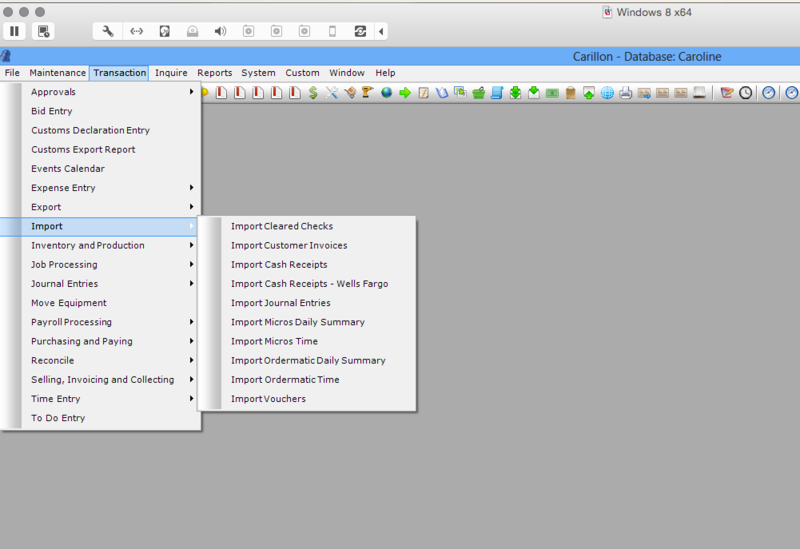 With a quick click of a button, Carillon allows you to post your payroll in record time! We also interface with OrderMatic® and Eight™! Visit CarillonERP.com/QSR for more information. If you’re interested in purchasing Carillon ERP for your business, please give us a call and schedule your free Carillon demo. We would be happy to show you in person how our system works with your POS system. There is no relationship or association between MICROS Systems, Inc. and Carillon Financials Corp.
Carillon® is a registered trademark of Carillon Financials Corp. All other trademarks are property of their respective owners. Copyright © 2015. All rights reserved.